Spring and Summer is a beautiful time to go to the beach. Book you vacation now! This is your condo !!!!! Romar Place is a three bedroom, two-bath condominium that is located directly on the sugary white sands of the Gulf of Mexico in Orange Beach, Alabama. (678 -488-0553) This seventh floor unit has a large Gulf-Front balcony with spectacular east views and direct gulf front views of the the beach in beautiful Orange Beach, Alabama. 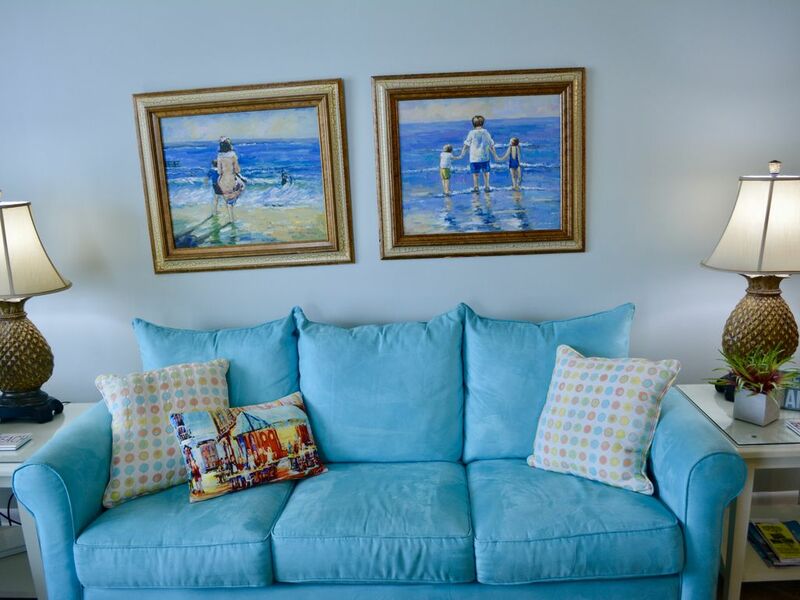 This beautifully furnished condo features a large beach mural on the wall to welcome you into the condo. It also includes an underwater mural under the breakfast bar area. This gives you the vacation feel from the time you enter the condo until the time you depart. It features a large master suite with a king-size bed, 32' Flat Screen LCD TV, DVD Player, large private bath with over size bath tub, and a sliding glass door that leads to the Gulf-front balcony. The second bedroom is decorated with seahorses and features a queen-size bed. It also includes a 20' Flat Screen LCD TV and a DVD/VCR Player. The third bedroom has two twin beds and a 20' Flat screen LCD with DVD Player. There is also a queen size sleeper sofa in the family room for additional children. The kitchen is fully equipped with a full-size refrigerator and icemaker, microwave, oven, dishwasher, and garbage disposal. The breakfast table sits six people comfortably. The breakfast bar has four additional seats. The family room has a 42' Plasma Flat Screen TV and DVD (Blue Ray) Player. There are two separate sliding glass doors from the family room to the balcony. All you have to do is come and enjoy. Everything is here for you in this little paradise. You can relax and enjoy the beauty of the sea and the white sand. Pick you best spot on the beach since this is a low density 66-unit complex there is plenty of room for you to read a good book on the beach or just watch the people walking by. There are plenty of great restaurants, shopping, and playing. After all the fun you can sit on the balcony and just enjoy the sound of the ocean crashing on the white sandy beaches and the view of the dolphins frolicking in the ocean. What can be better than this wonderful paradise?! For larger groups, inquire with us regarding the availability of an additional adjoining 3 BR/2 BA condominium. My name is Tammy Wood, I am originally from Mobile, Alabama but live in Alpharetta, GA now. I have grown up going to the beach all of my life. I have two children, 21 and 19 who enjoy the beach as much as I do. I wanted them to have the same experience that I had at the beach. So we purchased our condo in 2003. I have been renting it ever since. It is wonderful to hear all of the stories from renter's who enjoy the beach as we enjoy the beach. We chose Romar Place for several reasons: 1. It is a low density building and you always have room on the beach, outdoor pool, indoor pool, hot tub, work-out room and outdoor grills. 2. You can view the Ocean from the den and the kitchen. Many of the condos I looked at had the kitchen off to the side and you could not see the gulf or visit with the family that was in the den. At Romar Place you can visit with the family that is in the den and see the ocean all while cooking in the kitchen. 3. The indoor pool was huge for us, because I have 2 children that like to swim all year long. It is also nice to use when you have had a little too much sun. The Wharf, Skim Boarding, Body Surfing, Playing in Waves, Enjoying the sound of the waves crashing on the beach, Looking for shells. Had everything you needed. Very well maintained and clean. Our family had a very relaxing and enjoyable vacation. Loved being right on the beach. Our unit needed a few updates but nothing that would stop us from vacationing there again. This condo had everything we needed and more! My family and I had an amazing vacation here! The beach was spectacular and the views from the balcony were awesome! So many things to do close by as well. Definitely will be back! The condo was charming, clean, and accommodated 6 adults and 2 small children. Everything was in working order. We enjoyed relaxing both inside and on the balcony - especially when when we could see dolphins. We plan to return. If your looking for a condo with granite countertops and high end finishes at a high price this isn’t for you. But if you are looking for nice furnishings and one of the best stocked kitchens I have ever seen...with a great floor plan and terrific location, then this IS for you. Couldn’t have asked for anything better. Will definitely book this condo again!!! Very nice place. Fully furnished with kitchen utilities and pots and pans. Bed we're comfortable but living furniture could use an updating along with dining chairs. Weather was great and the beach was beautiful. Our family just loved this condo. It was perfect for 3 adults and two children . The view of beach was perfect. Had a great outdoor pool and indoor pool and hot tub. We are cooks and the kitchen had everything we needed. One of the best stocked kitchens I have seen . Unit was decorated very beachy! Had a beautiful deck for eating outside and watching the dolphins every morning . Rented beach chairs for the week . Didn't have any problems but owner left number if we did . Mostly just enjoyed the beach but many activities close by. We all chose to do Parasailing and the company was just down the road . Our first time in Orange Beach but won't be our last ! Would rent this condo again if we are lucky enough to come back ! Almost hated to give such a great review, want to keep it to ourself !!! Thanks Tammy for sharing your lovely condo ! Rates subject to change until confirmed. No student rentals. Must be 25 to rent and remaining on property. Security Deposit 350.00 Additional charges may apply Summer Rental is Saturday to Saturday Only Please take out trip insurance for your stay.